After a little over indulging on the holiday weekend I was looking for something on the lighter side and a salad fit the bill perfectly. When I made the candied walnuts last week and I immediatly thought about using some of them in a salad. One of my favorite winter salads is a pear salad and I was thinking that adding candied walnuts to a pear salad would work really well. 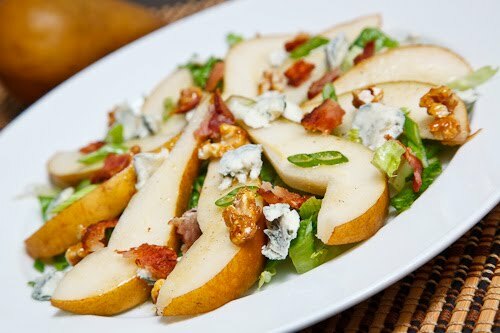 Gorgonzola and pears are another great flavour combo and I could not resist adding some to the salad. With sweet and tangy taken care of I added bacon for some saltiness and I then finished the salad off with a simple maple dijon vinaigrette that used walnut oil for even more walnut flavour. This pear salad is pretty simple and yet so good! The pear, gorgonzola, bacon and candied walnut combination is really nice and it works well in a salad. Mix the lemon juice, oil, maple syrup, dijon mustard, salt and pepper in a small bowl. Toss the salad with the dressing to coat. This salad looks like the perfect way to perk up winter!! Yay! I'm glad you're back and this looks great! Thanks! I've never paired up pear and bacon but I would try this out. Sounds really interesting. What a perfect salad for winter-Just beautiful. That looks so good! Your salads are always so inspiring. Perfect post-holiday meal. I make a version of this salad and it's my absolute favorite! Tours looks beautifully delicious! What a great combination of ingredients for a salad! This is one of my favorite salad combinations! I can't wait to try your version! Looks delicious! Welcome back…and with a delicious salad. I love pears with blue cheeses! Well, this is what Id call a most flavorful explosion of deliciousness in one bite. Sounds wonderful! What a killer combo! Amazing flavors! That picture is amazing, Kevin, and that salad has some of my favorite things in it. Awesome! This salad looks extra special with those pear slices.. This is one lovely & superb salad!! I so love all of the textures, Kevin!! This salad looks like a perfect holiday treat! Hope you had a lovely Christmas. Wishing you a Happy New Year! This is another excellent use for those candied walnuts. I love the sweet and salty you've got going on! I've been looking for something to do with the abundant winter pears and this is it. Love the flavors. Happy New Year! If you were a smurf, you'd be 'Yummy Smurf'…. I love this kind of salad with fruit, nuts, and some type of crispy bacon! Anything with gorgonzola is fine by me! Classic and simple. I'm always a fan of gorgonzola cheese and pears. Wow! I would never think of such a combination but it looks so good it just has to be good! If i leave out the Bacon and cheese will it still taste good? Anonymous: I think the pears would be a little lonely if left only with the walnuts and the dressing. You could easily omit the bacon but I try to keep the cheese, another mild blue cheese or feta or goat cheese could be substituted.